You can earn 17 Club VM Points on this product! 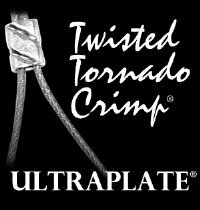 The "The Twisted Tornado Crimp®" ULTRAPLATE® is one of the best innovations to ever hit the jewelry-making business. The slight twist in the crimp allows the finding to secure to your stringing wire unlike those ordinary, dull and unfinished looking flat crimps. There is no special tool needed! Just take your flat pliers with the tapered end (chain nose) and press down firmly on the crimp to secure it. The "Twisted Tornado Crimp® ULTRAPLATE® .024" adds the perfect touch to your beautiful jewelry designs. It will truly BLOW YOU AWAY! Please note the before crimping and after crimping picture above. The Twisted Tornado Crimp® ULTRAPLATE®.024 works great with our .024 Synergy Beading Wire™! If you would like to see information on how best to use the "Twisted Tornado Crimp® click here. See our How To Video below! How do you use the product? : I use these crimps on all of my necklaces and bracelets, have been using them for years as they are the only ones I will use! They do not require crimping tools and my jewelry comes out with a beautiful finished look ! How do you use the product? : I use the twisted tornado crimps for all my wire necklaces - .019 and .024 - I have been using them for the last 10 years with great confidence ! How do you use the product? : Wonderful, just as I remembered.